Who else loves candy? Adults love sweet treats just as much as kids, which is why a candy buffet is always a hit at parties. It is great fun to fill a goodie bag or box with your favorite sweet treats. Candy buffets make great party favors, and they can also be a colorful decoration for an event. 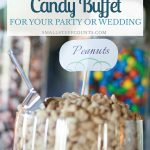 I created a candy buffet for our wedding and was surprised how many decisions can go into it. Should I have green or blue M&Ms? Where should I order the candy from? What types of containers are best? Where do I get those fancy looking scoops? Candy buffets in magazines are colorful displays of perfection. But how do you achieve the color-coordinated, styled look in real life? 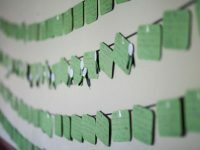 I’m sharing my ideas and tips in this blog post, complete with a printable checklist. Candy buffets look more stylish when some thought is put into keeping the candy and decor within a cohesive color palette. 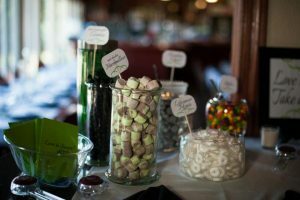 Match your candy buffet to the party’s color scheme or theme, and it will add to the decor of the entire event. 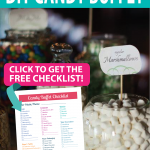 When it comes time to purchase candy for your buffet, the options can be overwhelming. My advice is to choose a variety of flavors and types of treats. Also consider incorporating various sizes and shapes of candies to keep things visually interesting. Candy can be ordered from many websites or purchased from a grocery or party store. Treat Suggestions: Fruity candies, lollipops, chocolates, macaroons, cookies, nuts, mints, marshmallows, popcorn, pretzels, cupcakes, rock candy, etc. You can get really creative when it comes to containers to hold the candy. Vases and apothecary jars are always pretty and allow the vibrant colors of the candy to be fully visible. There may be other containers that would complement your party theme, such as colorful bowls for a kid’s birthday party or tin pails for a rustic look. You will find containers in a variety of places. For my wedding, I gathered an array of glass vases and bowls from local thrift stores. If you don’t want to go thrifting, look for containers at party stores, craft stores, department stores, kitchen aisles and online. Container Suggestions: Apothecary jars, trays, platters, cake stands, bowls, vases, pails, baskets, etc. This is an important element that is easy to forget! You’ll want scoops and tongs for each container to make it easy for guests to scoop small candies. I found a package of affordable silver plastic scoops for our candy buffet. Utensil Suggestions: Clear scoops, metal scoops, colorful spoons, clear plastic tongs, etc. The packaging can make a big impact on your candy buffet! 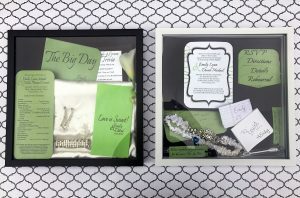 Have small bags or boxes available for guests to fill and take home as party favors. The options for creative bags and boxes are endless! 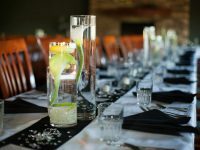 Choose colors and designs that match your party color palette and theme. 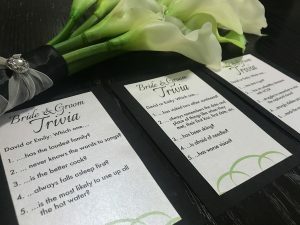 Our wedding colors were green and black, so I found small green paper bags at the craft store and ran them right through my inkjet printer to print a customized saying on them. Favor Packaging Suggestions: Colorful paper bags, take-out boxes, organza bags, plastic treat bags, favor tins, small gift boxes, etc. 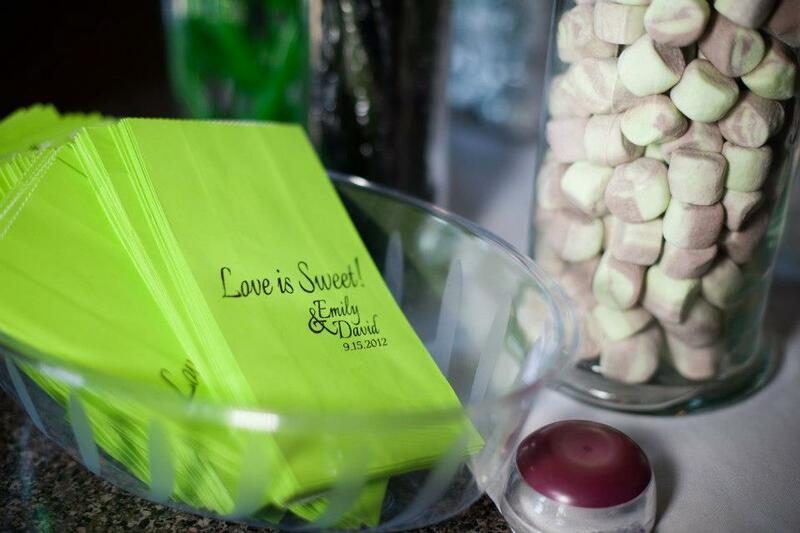 Labels and signs are little details that can really up the cuteness factor of a candy buffet. 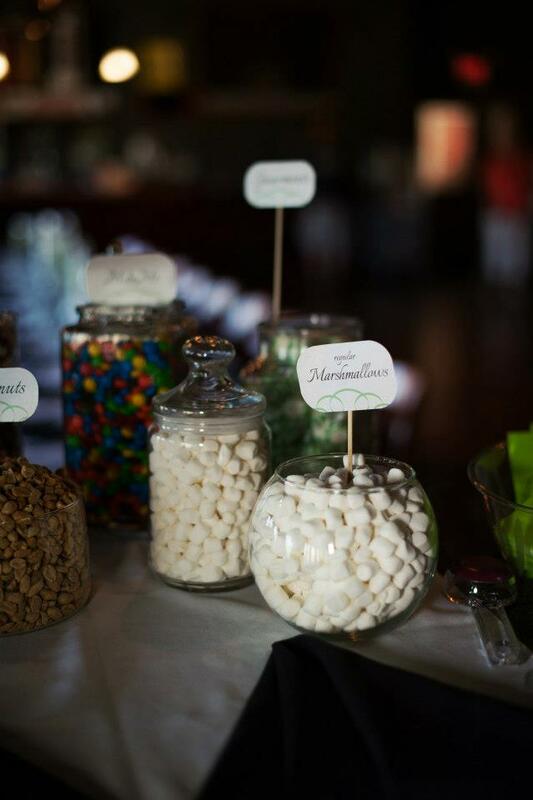 You’ll want labels for each candy container, along with a larger sign or two on the buffet table. There are a lot of really cute sayings you can use on a sign. 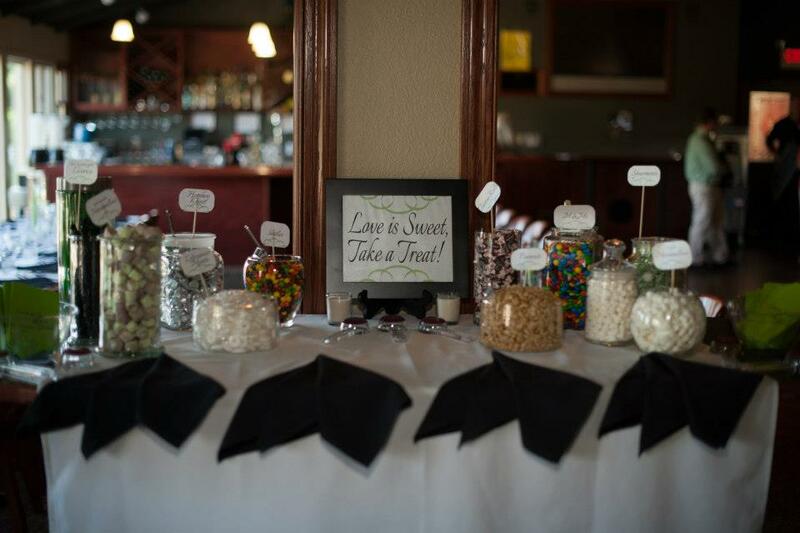 For our wedding, I framed a sign that said “Love Is Sweet, Take A Treat”. It was a simple sign printed on my home printer and displayed in a standard back picture frame. As for labeling the candy containers, you can use a variety of types of labels. I printed card stock labels and taped them to wooden skewers to stick in the candy. You could also clip chalkboard labels to container edges, use ribbon to tie a label around a vase or create small tent signs to set next to each container. 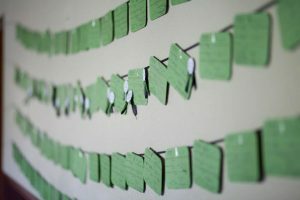 Sign & Label Suggestions: chalkboard clothespins, ribbon labels, labels on sticks, title signs, etc. Brightly colored candy and containers are decorations themselves, but you will probably want to add in a few additional decorations to complete the look of your candy buffet. Things like backdrops, garlands or a vase of flowers can complete the look and tie the buffet in with the rest of the party decor. 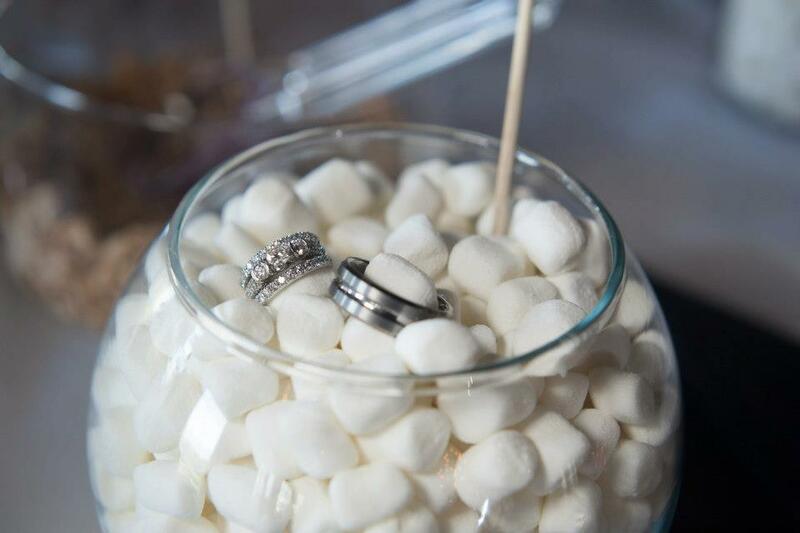 You can also use decorative crates and tiered trays to add different levels to your candy buffet, just turn a crate upside down along the back of the table and set a couple vases on candy on top of it. Although it’s fun to add in decorations, try not to overcrowd things. 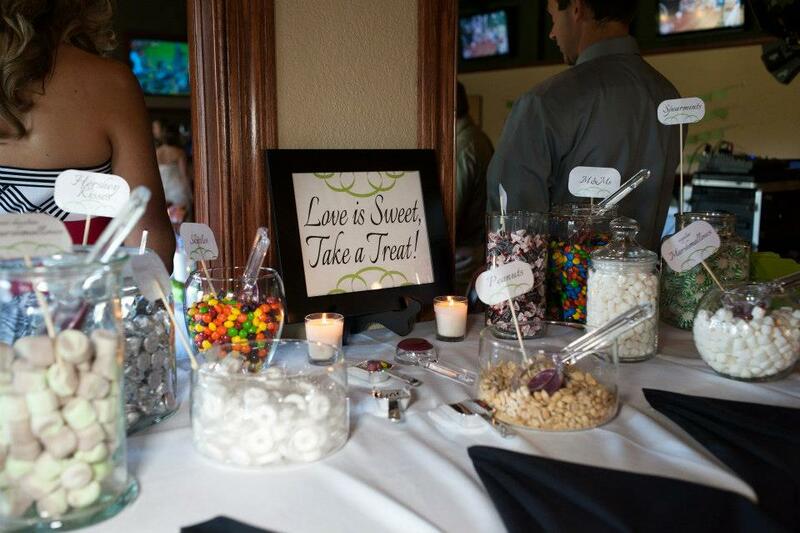 You want to leave elbow room so your guests can easily reach the candy without worrying they will knock things over. We had a small table to work with at our wedding, so I added minimal decor to it. I do wish I would have made a pretty banner to hang along the front of the table. Decoration Suggestions: Burlap banner, backdrop, tablecloth, flower bouquet or loose stems, balloons, wooden crates, tiered trays, etc. 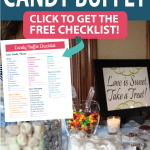 Want to plan an amazing candy buffet for your upcoming event? This checklist will help you do just that! 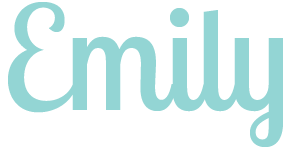 Subscribe for instant access to the checklist plus weekly organizing and DIY tips. Hooray! Your checklist is on its way to your inbox. Happy party planning! 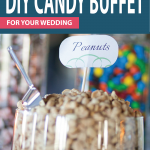 An eye-catching candy buffet is a fun way to display treats or favors at any party, and it’s a party element that adults and children alike are sure to love. 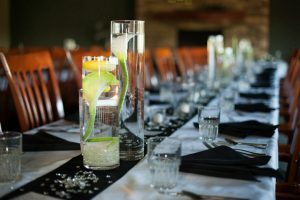 Do you need help planning the rest of your party? 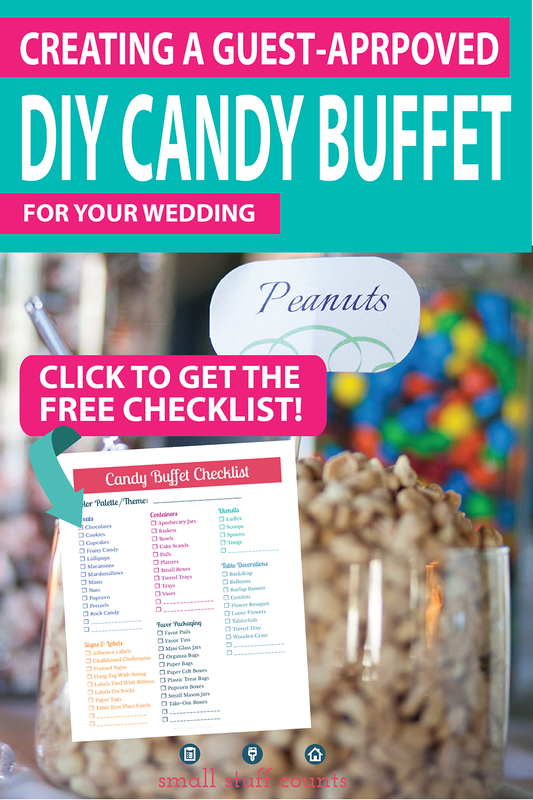 There are so many details that go into party planning, and a candy buffet is just one small part of it. 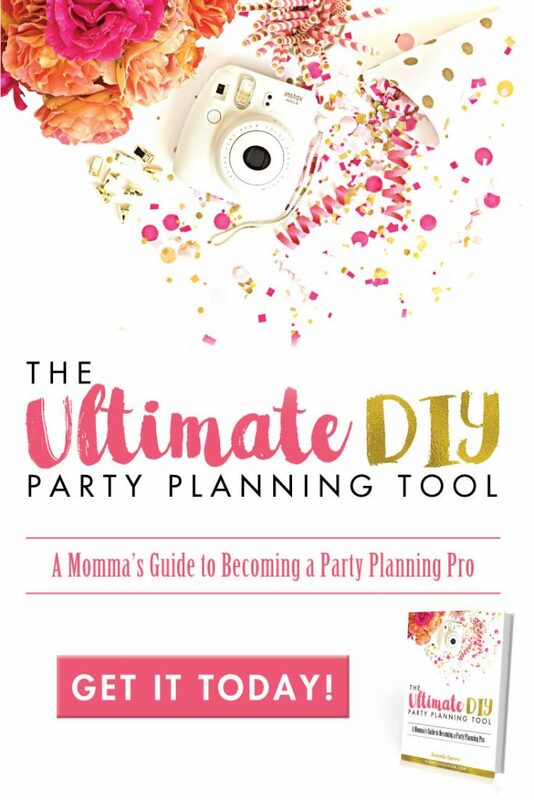 My friend Amanda’s new ebook, The Ultimate Party Planning Tool, walks you through the party-planning process step by step. 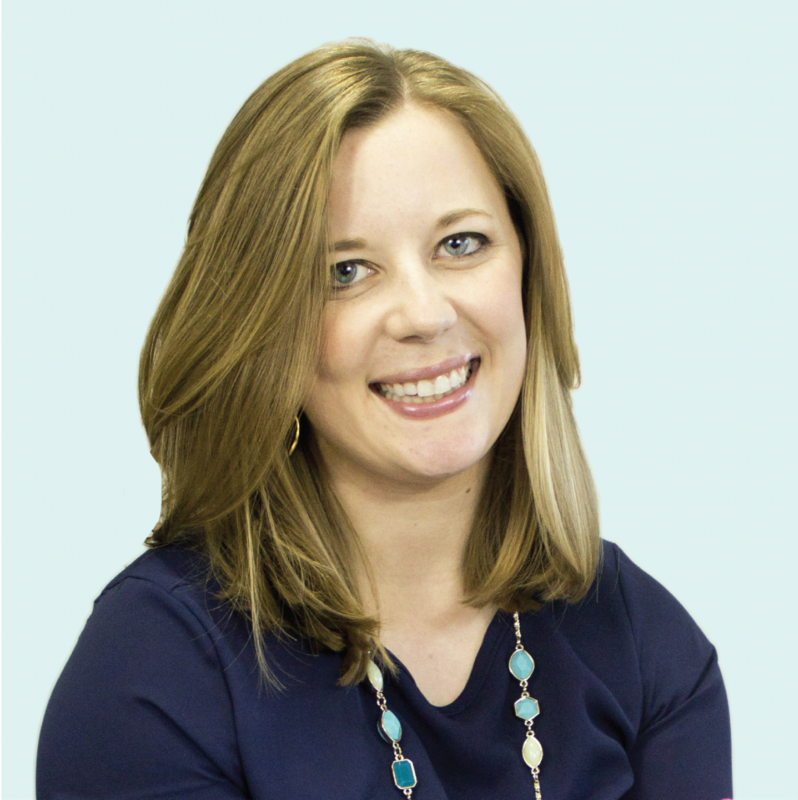 She takes the guesswork out of planning and covers everything from choosing a theme and inviting guests to make simple decorations and planning the menu. The ebook also comes with free printable checklists and resources that you can use over and over again for all of the showers, birthday parties, block parties and other celebrations in your future. You can learn more about her book here. P.S. Looking for more wedding planning inspiration? 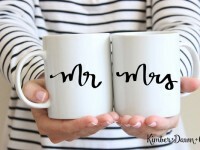 Take a look at these other posts in my DIY Wedding Series.